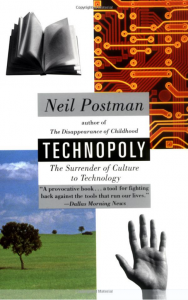 Technopoly is a condition that exists when technology begins to control too many areas of human life. But, of course, that is a ‘‘catch 22’’ situation. We need and usually desire to have technological advantages but we often hate what they do to our lives. The clock was invented to regulate the prayer time of twelfth century Benedictine monks but has become the means for selfish men to make money. If you decide to skip this book and go straight to the polls and market studies, you will prove his thesis correct.